Stopped at CVS because I live too close, apparently, to get a paper ad in my Sunday Trib. Just happened to have a few inserts in my bag left over from Sunday’s Walgreens purchase so when I saw what spit out of the Magic Coupon Machine, I pulled them out with my trusty scissors. The Nutrisse are Buy 2 get $4 in ecbs, so I bought two, used two $2 coupons from 5/13 rp plus a $9 Beauty coupon. 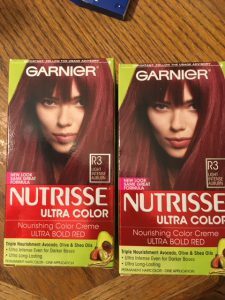 Also got two free hair color coupons, which I’ll use later in the week or even next week. They automatically deduct $9 each, so if I’m buying Nutrisse I’m blowing a few bucks on each – – not smart. OOP was $1.35 and I got my $4 in ecbs (limit one). The $2 SavingStar rebate was limit one and that’s what I used at Walgreens. Maybe next week they’ll reboot.